When you hear the word eBooks, the basic idea you get is the innovation in it. You can do a lot many things with the help of eBooks beyond the usual books. The bounds that you usually have with the physical books are quickly gone past with the eBooks. After all, eBooks are the next best thing in the publishing world. You have limitless features for your use, like sharing, annotations, bookmarks, and much more. Also, the primary feature you have for eBooks is that it allows you to bring millions of books to your device. The latest innovations in which you have the eBooks are pushing the limits for reading. Enhanced eBooks which are here to stay, offer plenty many choices for reading. Daisy Digital Talking Book is one of the few book formats which usher the present to future. Thus, here’s what you want to know. With Daisy digital books, you have the chance of not only just reading the eBooks but also listening to them. How is it achieved? Well, you have the option of getting a voice to read out, rather talk out your text. This works like the usual Text-To-Speech features we usually have on the smartphones and devices. Also, if you are someone who is using PC systems, or Mac for that matter, you will find that you can have a voice out feature in the accessibility features. Daisy digital books work in a similar fashion. However, they go beyond the usual confines of Text-To-Speech confines. Let us look at how it is a game changer which is bound to change the way we read. The word DAISY is an acronym for Digital Accessible Information System. As the name implies, the tool looks to get users to access their content in a whole different way. The Daisy digital books are something of a standard when it comes to designing, publishing and developing content for Audiobooks, enhanced eBooks and more. Daisy forming tool is specially brought out to have people with ‘print disabilities‘ to read content. Thus the format gives them all the opportunities to go beyond their limitations and consume content like never before. You have all your audio formats in this like, MP3, MP4, AAC, FLAC, etc. which are the major ones in the industry today. Users can search, place bookmarks, navigate the content line by line. In addition to this, you can regulate the speaking speed without distortion. DAISY also provides open tables, references and additional information which. As a result, DAISY allows visually impaired listeners to go through something as complex as an encyclopedia or textbook. Usually, you cannot think that reading these books is impossible in normal situations. However, now, with Daisy digital format in place, reading by your eyes is a thing of the past. With the audio sync being the best feature in this format, you will find that there are many things which help it along the way. These are the factors which help analyze, loop and format the audiobooks with exact sounds and voices. After all, the aim of this format is to replace traditional publishing. A dream which can only be achieved if Daisy evolved to the stage of perfection. The following are the factors which allow it to do what it does best. Package File: A set of metadata describing the Database of Text and audio files. Textual content file: Contains the text of the document in XML. Audio Files: human or synthetic speech MP3 recordings. Image files: To display visual content in easy and understandable manner. Synchronization files: synchronizes the different media files of the DTB during playback. Navigation control file: for viewing the document’s hierarchical structure. Bookmark/Highlight file: support to user-set highlights. Resource file: You can playback files and manage it in the way you want because of this. Distribution Information File: maps each SMIL file to a particular media unit. These elements help Daisy become what it is. For organizations and people who want to extend care for the visually impaired, Daisy offers many ways of doing that. Since, many people with disabilities, often use Daisy, many organization is looking to use it. Also, Many of the existing organizations which produce accessible versions of copyrighted content are moving to the DAISY standard. In effect, they are slowly moving away from more traditional methods of distribution such as cassette tape. It is an interesting thing to look at how Daisy digital format is changing the world. Or helping it do better. With organizations and medical care colleges taking up this form, we need to have a look at what this all mean. 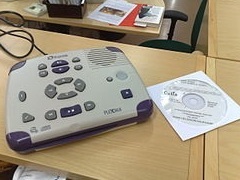 In the the United States, National Library Service For The Blind And Physically Handicapped, which happens to cater to millions with disabilities, has picked up this format as their default content file. Of course, the reasons are understandable. Not only does Daisy help you access millions of books within the devices but also lends plugins for others to work on its platform too. In addition to NLS in the United States, the organization like Learning Ally, Bookshare, and many others use this format. After all, it is perhaps the next step in providing content to people under their care. Learning Ally and Bookshare allow the access to people who have dyslexia and other disabilities. The idea is to give support to a person’s ability to read print. NLS, on the other hand, uses a more library approach to utilizing Daisy format books for its members. The library methodology involves books being loaned in the same manner as other physical books are. Hence, these books are available free of cost for the members for a specified period. Bookshare membership is free to US students, as per the funding from US department of education. Thus, Daisy digital is making readers more aware as to the new technologies which allow you to use it for future purposes.Hence, these books are available free of cost for the members for a specified period. Bookshare membership is free to US students, as per the funding from US department of education. Thus, Daisy digital is making readers more aware as to the new technologies which allow you to use it for future purposes. When the question of playing and using Daisy formats comes, the answer is pretty simple. On any worthy eBook reader which supports audio playback. This means that you can load up the Daisy formats into eBook readers like Helicon, BlueFire, Aldiko, etc. which have the sound play support. Thus, You can go ahead and use it on any eBook reading app. Having said this, You can use the Daisy format on specially designed DAISY readers as well. Also, if you have a Windows system, then you can download the required software from the website and install this. The plugin comes with a small package which you can install practically on any version of Windows. Additionally, you can use this format to play on your MP3 players or Audio players who support the format. Of course, to lend support for the Audio players, you may have to buy the latest versions of Audio players or go for a software update. You also get the additional benefit of using Daisy format for BRAILE version of texts. With good accessibility features, any Braille player or reader can speak out the text given the device. You can adjust the voice features of the BRAILE devices to get it to use the Text-To-Speech functions. It’s that simple. And efficient. You can practically use Daisy to read a book. Load up the format into your device. Sync it with the reader, and you are set. Thus, you can use this format to read books at a faster pace or rather hear them out. The feature saves time and effort in completing a large book. Thus, the format is a boon for consumption of content. The main idea behind having an Audiobook format which could understand the context was to make reading easy. And on the way help those who found reading difficult. The digital book format came out basing on this idea. You could listen to books, without even touching a single page. Therefore, people who are visually impaired can depend on this to fulfill their reading needs. 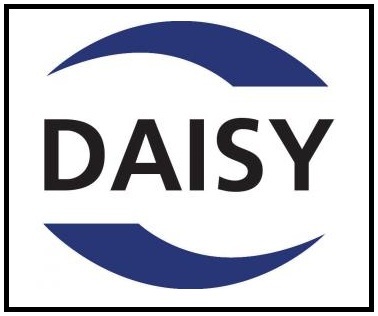 As we saw earlier, Daisy is a format which is presently used by organizations like Learning Ally and National Library Service. These organizations have pushed forward the format. Also, these organizations allow access to people who are suffering from Dyslexia and other disabilities. You will find that these organizations, use Daisy in different ways. However, you can see that the code remains the same. Both Learning Ally and Bookshare which use this format, do it in the form of Subscription service. If you are someone interested in getting the format onto your device, you will have to register. Once you do so, you will get the format instantly. Although the basic structure remains the same, different firms use different methods to keep it safe. It could be Audio itself, or SML files which are changed. You have the files encrypted and decrypted in someway or the other. This is usually done to protect the files from being misused. The encryption is something of a norm when it comes to using this format. However, Bookshare actively never uses the encryption. The site primarily downloads from the server. This is where it gives some protection. If you are a returning user for the site, you will have to provide login data to get the files. Now once you have downloaded the file, you can use it on multiple devices. If you have a DAISY device with, you can easily get the file onto the device and use it. The device will read any open format as long as the reader is compatible with the format. To produce worthy content for visually impaired users, Microsoft has taken a step forward to use Daisy format. It now allows users of MS Office to save their files in Daisy format. What this implies is that you can now save Open XML files as DAISY XML in your system. All you need is a plugin. You will need to get the plugin from the Microsoft page. And then you are good to go. To use Daisy in your Microsoft Office, the steps are simple. In case you are using the Microsoft Office versions 2003 to 2007, you will have to install their add-ons. Visit site, search for it, get it. As simple as that. 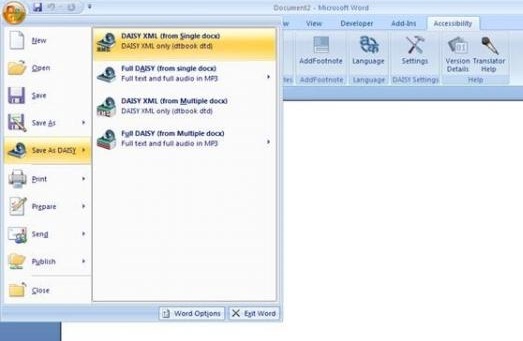 Installing this add-on allows Word documents in Open XML format to be saved into DAISY XML, which can then be converted into DAISY Digital Talking Book (DTB) format. The advantage you get by syncing this add-on with MS Office is that you get direct export capabilities. While you can save the file in digital format, you can also directly share it with emails and other clients. This was you can also save the formats on Cloud as well. If you have a decent enough Windows PC, you won’t find much trouble loading it up. In any case, the requirements for getting the digital content to work with MS Office, are – Microsoft NET Framework 3.0 installed. You can download this from Microsoft NET Framework 3.0 Redistributable Package, Microsoft Office 2007, Microsoft Office 2003, or Microsoft Office XP with Office 2007 compatibility pack installed. Microsoft Office 2007 or Microsoft Office 2003 Primary Interop Assemblies (PIA) for your version of Office. Java Run Time 1.5. As we saw earlier, it is a pretty decent task to save XML to this format with the help of just an add-on. You need to just to install the plug-in and get going. The options that you get with this plugin is that you can save it as Full Daisy format or XML from multiple batch files. These can again be opened in MS Doc or Other Office programs. Thus, you can open and still edit the whole XML coding. You won’t have to get any other additional tools for doing so. However, when the codes are XHTML or HTML5, you may find it difficult to use with this plugin. Having said this, with recent MS Office 2013 and after, you will see that this sync can still be done. However, you need to ensure that you are getting the latest version for Daisy into the system. This way you can ensure compatibility between multiple formats and add-ons. Having said this, you can still not use MS Office, with the latest version. So to say, MS Office 2016, is not yet compatible with Daisy XML in office. You will need to validate the file before saving it as XML file within your system. This is a significant step in ensuring that the quality is not missed at all. While validating, if the input document does not contain validation error then a Message Box appears indicating that the document is valid. If the validation fails, the list of errors is shown in a dialog box. You can click on an error to locate the error in the document. You can also click on “More Info” to open the Help Manual for more assistance. Microsoft’s initiative to put ‘Save as DAISY XML’ in Microsoft Word is the first step to bring fully accessible content to people who are blind or who have a print disability. You have the better options to go beyond the confines of plain text materials. This new tool also presents the opportunity for organizations and independent software vendors to consider ways in which the technology may be employed to meet the needs of those not yet served by text-only or audio-only formats. Corporations such as insurance agencies, health care providers and companies that publish training manuals require a method to deliver fully accessible documents to their customers and employees with different needs. Daisy books then the company has recently brought out Android supporting apps as well. Now, you can easily access this digital formats on your Android device. All you have to do is download the Daisy2Go. This app uses updates and innovations to lend you support for viewing these eText materials. You can always open Daisy mail within this app, irrespective of their versions and make. Daisy2Go is a part of the Nuance Accessibility Suite, and it has been optimized for Nuance TALKS to allow for easy switching between audio and textual content. Now apart from the official reading apps, there is some third party in the market, which do the same job. After all, Android is an open source system, which allows third-party support as well. One of the few apps which do an excellent piece of work in accessing DAISY books is Darwin reader. The Darwin reader supports all the major version of this format and keeps on updating its system. You can easily transfer books in digital format via WiFi or USB Cable, into the device. And instantly you can read them. One other reader, you may find useful to read this format is Go Read reader. Read is a FREE accessible e-book reader for people with print disabilities. Read works on a variety of Android tablets and phones. Features include searching and direct download of books from Bookshare and reading with voiced navigation and text-to-speech. You can open DAISY 3 text and ePub two formats, apart from other formats like Mobi and PDF. Another simple option to get reading the Daisy digital book format is a nifty tool called Open Source eBook reader. This is also available in Google play store for free. Additionally, you can use this app with older versions of Android as well, dating back to even Froyo. With multiple options available for an average user in today’s world, one is left spoilt for choice. Ebook readers like Kindle, Mantano, and others are always making their mark in the mobile web world. When you come to PC environment, you have software like Sigil or Adobe Readers, which have made eBook reading the next big thing. Of course, with new formats cropping almost every day, you will need something more from every eBook reader you have. The ends are unlimited. DAISY format is a step forward in changing the way we read our content. For its many uses, the format is being lapped up by many organizations all over the world. The intent behind this is to cater to those having difficulties in reading content. Thus eBooks are serving a great social responsibility. If you are a publisher and looking to bring out content which helps change the society, look no further. You just need a professional publishing company by your side. And we are just that. Our innovative products and services will help transform your work to be compatible with almost any reader and platform out there. All you need to do is, drop us a mail and let’s start making a change for real.